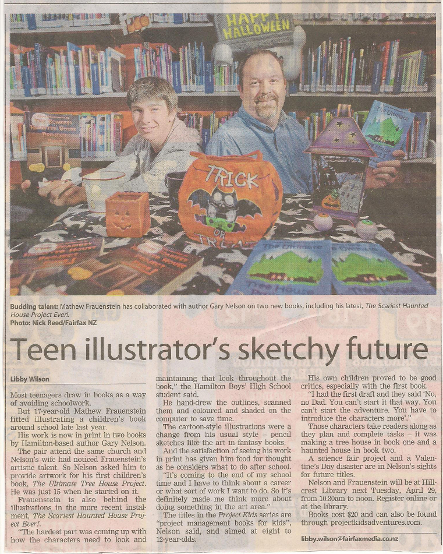 Waikato Times reporter Libby Wilson caught up with Mathew Frauenstein and author Gary Nelson as they were setting up for a book reading event at Chartwell Library, Hamilton NZ. The event was part of the launch of Project Kids Adventures #2 - The Scariest Haunted House Project - Ever! Book reading - The Scariest Haunted House Project - Ever! 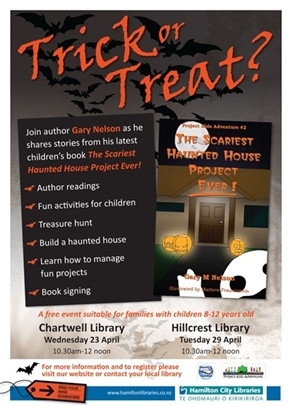 Come and hear author Gary Nelson talk about his new children's book The scariest haunted house project ever! Fun activities for children will include a treasure hunt and building a haunted house - find sets of scary pictures hidden around the library and exchange these for haunted house pieces. Read more about Book reading - The Scariest Haunted House Project - Ever! Gazza's eBooks are now available on Scribd! All of the Gazza's Guides books - including the Project Kids Adventures series, are now available through Scribd, an online reading community that boasts 10 million readers visiting their site each month. Members can read an unlimited number of titles each month for a flat subscription price. Read more about Gazza's eBooks are now available on Scribd! I am honoured to be a featured author in The Read Across America event being hosted by Our Mom Spot during March 2014. The Scariest Haunted House Project - Ever (Project Kids Adventure #2) is now available for Pre-Orders! Order today to get a special discounted rate.